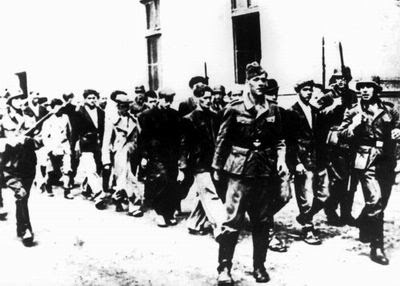 Following the successful organized uprising, the first of its kind in occupied Europe, by the Serbian resistance forces under the command of Serbia’s General Draza Mihailovich that not only threatened Germany’s southern flank in Europe and her occupation of Serbia after Yugoslavia fell to Hitler in April of 1941, but critically delayed Hitler’s planned attack on the Soviet Union that summer, the Germans retaliated. But it wasn’t in the usual way, man to man, soldier to soldier. 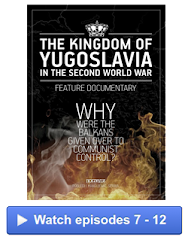 The method of Nazi retaliation initiated against the Serbs was unprecedented, and the target was the civilian population. 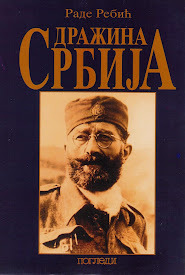 Hitler’s aim was to suppress the Serbian insurgency against the Nazis and to do so by the most brutal means. 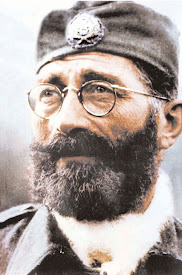 He intended to literally terrorize the Serbs into submission by going after their most vulnerable citizens, and he decreed his intention via the new “law” in Serbia that took effect in the late summer of 1941. Although there are so many documented atrocities that were committed against civilians during the course of World War Two throughout Europe, there are still those atrocities that stand out as singular examples of man’s capacity for inhumanity against man. 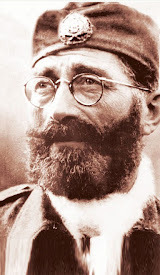 The Kragujevac Massacre of October 1941 is one of those singular examples, and it would have a profound effect on the way that General Mihailovich and his Chetnik forces would conduct their military operations against the enemy German forces ever afterward. On September 6, 1941, after a series of successful Chetnik attacks against German forces in western Serbia, Adolph Hitler issued the unprecedented reprisal decree that for every German killed, 100 Serbian hostages would be executed. For every German wounded, 50 Serbs would be shot. This decree was posted throughout Belgrade, Serbia on September 13, 1941. Your task always is to be in total control of every village in this country in which German blood was shed also in 1914. October of that same year, 1941, would prove just how “unequivocal” the lack of German mercy against their chosen victims would turn out to be. 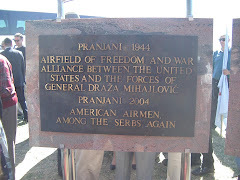 At the end of September, continued Serbian successes against the advancing Wehrmacht forces in a Chetnik anti-Axis action that took place between Gornji Milanovac and Kragujevac in Serbia resulted in 10 Germans killed and 26 Germans wounded. The German forces that were deployed at that time in the Serbian city of Kragujevac were under the command of Major Paul Koenig. In response to the German casualties, Koenig ordered a “comprehensive reprisal” to be carried out against the Serbian civilians living in Kragujevac, even though no attacks had been made in that city against the Wehrmacht! 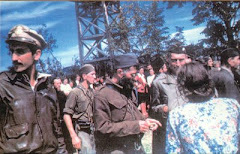 The reprisals began on October 19th as Germany military forces burned several villages and several hundred Serbian civilians were executed in the Groznice area. But, that did not satisfy the Nazis. On October 20th, 2,300 men and young boys were rounded up, all between the ages of 16 and 60. In this group were included civil servants from city offices that the Germans raided, who were not engaged in any military actions. But the crowning atrocity was the inclusion of 300 innocent children from the high school and 18 teachers who were ripped from their classrooms. On October 21, 1941, those lives were mercilessly ended. All in all, the estimated number of civilians who were executed in Kragujevac and the surrounding areas in those couple of days in October of 1941 is 2,800. 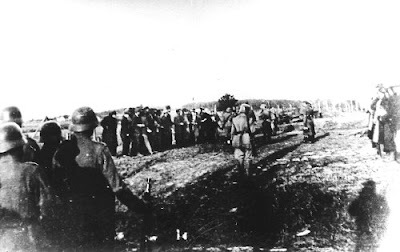 German troops lead their Serbian victims to the execution site. are assembled by the Germans at the execution site. The reprisal quota was indeed fulfilled and more so. 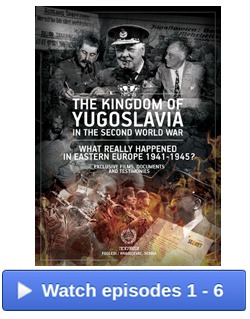 When an inquiry was made as to why civilians in Kragujevac had been chosen for execution when there had been no German casualties in that city, the answer was simply that “not enough hostages to fulfill the quota had been found elsewhere”. 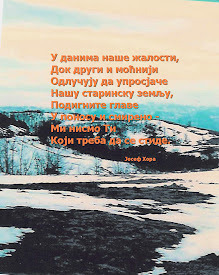 It is almost indescribable how deeply this tragedy impacted on the people of Serbia. The impact on General Mihailovich was particularly profound. 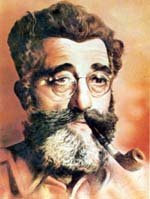 Though he had participated in several wars, beginning with the Balkan Wars of 1912 and 1913, followed by World War One and now World War Two, he now realized that to continue to attack German occupational forces indiscriminately would mean national suicide for his beloved Serbian people, as the October tragedy proved. 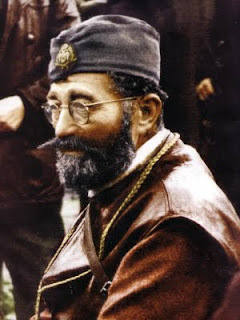 Mihailovic, who as a participant in the First World War had witnessed his beloved Serbian nation losing one third of its population and her army suffering enormous casualties, with 450,000 active soldiers at the beginning of the war declining to 60,000 by the time of the Salonica Front breakthrough of September 1918, would adjust his resistance policy to consider the benefit and effectiveness of each action against the German enemy in proportion to the human cost in Serbian civilian lives. General Draza Mihailovich genuinely cared about human cost and would conduct himself for the rest of the war accordingly. Such wartime decisions are testament to just how completely dedicated to his nation and the welfare of her people General Mihailovich was and remained. Those to whom the tragedy of October 1941 in Kragujevac never meant anything, later attacked Mihailovic for “not killing enough Germans”. The people that rendered these charges against General Mihailovich would later prove to be of inferior character, while Mihailovich would emerge as a man of true character, not only as a military commander, but as a truly good human being in the badness that is war. Even as he was being charged falsely by the Allies for “not being active enough against the enemy,” he would save hundreds of Allied lives from sure death at the hands of the enemy when he could have walked away and left them to the wolves. 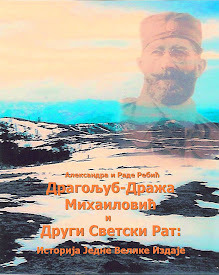 Though the legacy of Kragujevac remains as a tragic reminder of the inhumane nature of war, so, too, the legacy of General Mihailovich and his thoughtful response to such a tragedy transcends such brutality and reminds us that even in war there is humanity. Thank you for posting this, and the powerful poem in memory of all those beautiful children who were lost. The number of people killed, and the heartlessness of the Nazis are difficult to grasp. The courage and honor of those involved in the resistance is inspiring. You're welcome, Chris. No matter how "familiar" the Nazi methods are to us, there's just no getting "used to" the depth of their heartlessness. No matter how much time passes, I'm still stunned by it. That's one of the reasons why the tales of "resistance" are so inspiring. What guts it took to stand up to them.